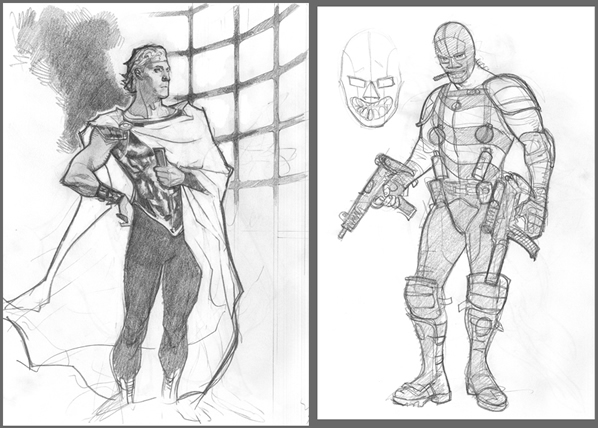 Comics artist Adam Hughes gives us a look at his character designs for the Watchmen movie. 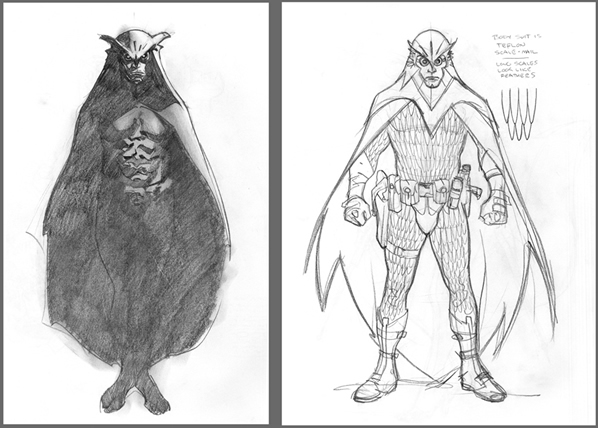 Acclaimed comic book artist Adam Hughes, who is known for his work on many comics including Catwoman and Wonder Woman, posted some of the concept art he was commissioned to create during the very early stages of pre-production for Watchmen. I was contacted by representatives of 300 director Zack Snyder, while 300 was in postproduction, about doing designs for 4 of the 6 main characters from WATCHMEN. Zack wanted me to design the look of the characters, and then do 4 'cover-quality' color illustrations to help convince the suits & ties at Warner Bros. Pictures to green-light his WATCHMEN film. After the success of 300, Watchmen was soon green-lit at Warners and Hughes never heard for them again — until the wanted to use his work in the Art of the Film book . Here are the sketches that Hughes did for Snyder with the artist's commentary. Director Zack Snyder said he really wanted to get away from the gold body suit with purple tunic look for the Big O, and kinda agree wit the sentiment. Making that suit from the comic could make or break the film; if the audience laughs at Ozymandias, WATCHMEN just won't work dramatically. …since the Comedian is just wearing military gear with a couple patriotic shoulder pads, I kinda thought he wouldn't need to be adapted for screen, either. But, they wanted to see a design, so I did one. It's basically the same as the comic. When director Zack Snyder spoke about Silk Spectre, he confessed she was the one character he was really unsure of how to tackle, costume-wise. In the comics, she is pretty much wearing black lingerie covered in a gossamer camisole; he felt that was not gonna work onscreen. I think he must've been relieved when I blurted out "Dude! Do her outfit in latex! You can make it have the same lines as her comic outfit, but it'll look cool onscreen and all the cosplayers will go nuts; it'll be a big fan-favorite!" I thought that no matter what details Nite Owl's costume had, as long as he kept Gibbons' 'owl silhouette', it would be a good design. Since the reason movie studios don't like superheros in tights (with the exception of Spider-Man and Superman, my 'never worked in Hollywood' first design (on the left) was a moody shot. If we don't show the general audience the 'silly superhero' by cloaking him in shadow (the way I figure guys like Nite Owl and Batman would prefer to operate), then everyone wins. Zack liked it, but rightly asked for a sketch showing details. Hence, the second looser sketch. 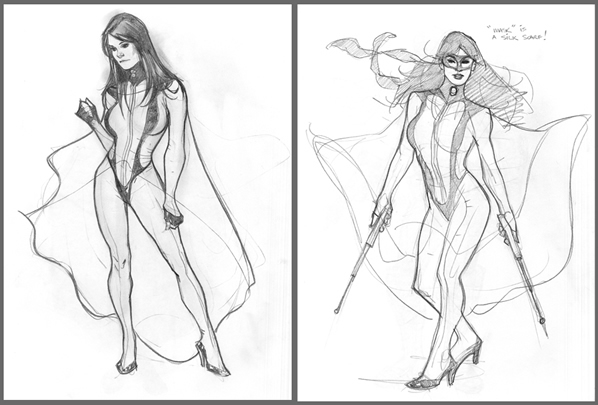 For more insights on some of these pieces and the full story of Adam Hughes Watchmen experience, head on over to his portfolio over at DeviantART.